One day a friend gave us a 50 gallon food safe barrel. And, like what often is the case I had an “ah ha moment". And said to Ted “Let’s cut in down, and I’ll dig a hole and sink it into the ground and have a little pond”. And that is what happened. 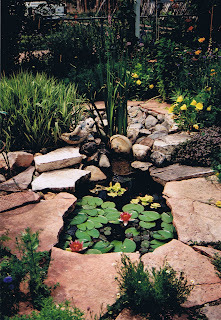 Water Lettuce and little goldfish added to the charm of this little pond. My garden paths are lined with local pink limestone. The limestone edge hides the barrel. The next year or so, after reading books on how to build a pond. I came up with this idea. I ordered the liner and a little pump online. The water circulated from the lower pond up through the upper bog. The left side of the bog was filled with washed gravel. I washed it and ran it through a plastic colander, bucket by bucket. Then planted a ribbon grass in the water. This worked for a few years, but the gravel eventually got messy and I wanted a bigger pond. Water quickly evaporated from this pond. A fragrant Roman Chamomile volunteer can be seen in front. Last spring, we ordered a new, better liner and picked a spot where the pond is visible from our kitchen-dining room windows. The old pond spot became a raised bed created by the dirt taken from the new pond. I made sure to put the poorer dirt in the bottom of the bed and the richer dirt on top. Ta-da! I think I like it! I like it too! Gorgeous! The one thing my garden lacks that I really want is a water feature - maybe someday I will have one as lovely as yours. Gloria, those are absolutely gorgeous! Your garden makes me dream. I loved seeing the evolution of your water feature. Of course the last is loveliest of all... but I really enjoyed all versions, and the water lettuce is so adorable. I can imagine watching the goldfish happily dart among those lovely, geometric leaves. Do you have any fish in the final version, I wonder? Dear Gloria, Water always adds a special element in a garden and you have obviously had great fun [and probably much hard work] introducing it into your own. You must be very pleased with the final result, and clearly you become more and more ambitious with each new pond you create. I thought the plantings around very attractive. Your pond is just beautiful. Thank you for sharing the before and after photos. :) A lovely spot to sit and enjoy the garden. Wow, Gloria. I love it. I particularly enjoy visits to your garden. 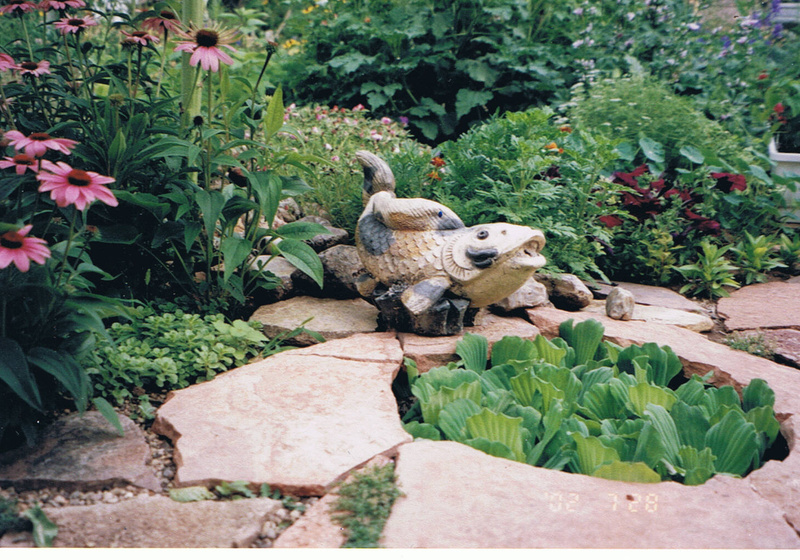 I love your style and the plants, pond and arbors are just perfect. Love it! Remember when we were emailing the other day and I mentioned that I had plenty of sketches kicking around for this summer's pond project? Well, I think mine might look a good bit like yours - if I get it done. I'm adding a solar splashy fountain thing for more noise. Your gardens are gorgeous, Gloria! I love seeing more and more of your garden, it's so pretty! I love how your pond turned out. It's similar to ours, only you have no liner showing :) The water lily is so pretty too. Do you have any fish in it now? You just never fail to amaze me with your innovative uses and designs in the garden. Using a food barrel as a pond is a keeper. It looks wonderful! HI Gloria I have never seen such great waterlettuce - it just doesn t like my climate here. Your waterlillies are really flourishing in your new pond and they are a beautiful colour. My one regret is that I did not plan my pond from the beginning as I cannot see it from the one window I spend much of my time at. You must get alot of pleasure from watching from yours. How come none of my friends are giving me such useful things as 50 gallon barrels to use in the garden? The last thing I received: a broken telescope. I need some new friends or some of your cleverness with cast-off items;) I bet your local birds adore your water feature. Hi Christine, let's see would that telescope work as a finial on top of a post? What a treat ... I like it too Gloria! Beautiful... Great Success! I would love to see more photos too. I love how you progressed from a food barrel... to your present pond... great idea to take small steps testing the waters so to speak... to be sure one wants to leap forward. I like your little pond too. The limestone paths are wonderful in form and color. Congratulations!! Wow! I love all the beautiful things you have added to your garden. It looks like a wonderful place to spend time. I love your rockwork, very nice! Thanks for stopping by my blog and saying HI. I think your blog has some inspirational ideas... I will return! You are so inventive, Gloria! A food barrel turned to a pond.... What a great idea! This corner of your garden looks very cozy and inviting. I also love that big stone fish, and the limestone is beautiful. I like your pond(s) too! I have a fish very similar to yours, and he is a favorite. We cannot buy water lettuce here in Texas, as it gets into the waterways, and causes all sorts of havoc, but we have water hyacinth, and they are very pretty. They also cause lots of havoc in the waterways, and you will have a fine if you throw them in a stream or lake. People are always giving us things, like the food barrel, and it all goes to a good use. Well, eventually it does, but my husband has such a head start on the givers, he will never get it all used up. He has junk everywhere. I love your yard. How long have you been working on this garden? It is lovely. Hi Gloria, I love your water feature, lovely use of stone and plants. Ye do seem to like your stone over there in South Dakota.